Light, wireless probes the size of a large pen have been developed to identify cancer cells and suspicious lymph nodes during surgery. The probes, which EPFL helped develop, are now being tested by surgeons at the University Hospital of Lausanne (CHUV) and across Europe. When surgeons remove a malignant tumor, they have to be sure to get all the cancer cells. Just as crucial, they have to determine whether the tumor has already sent micrometastases into the neighboring lymph nodes on the way to the rest of the body. EPFL, in partnership with Forimtech and the CHUV, developed two compact, light and wireless probes that help doctors with both of these tasks. The Gamma probe improves on similar devices already in use in radioguided surgery, while the Beta probe is a totally new type of device able to detect extremely small bits of cancerous tissue. The two probes, measuring 20 centimeters long and weighing barely 100 grams, are easy to work with and to insert into the surgical wound. The probes guide the surgeon with auditory signals similar to those of a Geiger counter, accurately locating what the human eye often cannot see. The Beta probe is based on a new concept of particle detection. It identifies the presence of even minute quantities of cancer cells from the main tumor. After removing the tumor, the surgeon will use the probe to see if there is any residual cancer tissue. The probe works by searching for positrons, which are given off by a tracer substance that, once administered to the patient, attaches itself to cancer cells. Positrons can only travel through one millimeter of tissue. When they are found, cancer cells cannot be far away. The Beta probe reduces the risk of complications and helps prevent the disease from spreading further. Because it pinpoints unhealthy cells, surgeons are able to preserve as much healthy tissue as possible. The device is still in the clinical test phase. A three-year effectiveness study on 60 patients is under way at the CHUV. The Gamma probe represents an improvement on an existing technology. It doesn’t detect cancer cells directly, but it finds the sentinel lymph node near the main tumor. This is the lymph node that cancer cells first reach before spreading to the rest of the body. It is removed and examined by doctors to determine the stage of the disease and identify the most appropriate treatment. “With the Gamma probe, we can remove just the sentinel lymph node. And if it turns out to be free of cancer cells, that means the tumor hasn’t spread,” said Maurice Matter, a surgeon at the CHUV. The probe that EPFL helped develop is lighter, more accurate and easier to use than competing devices, and it finds the sentinel lymph node more quickly. The probes, which were given the CE mark in March 2015, have already been used in around 30 operations at the CHUV. Starting this year, testing will be rolled out to hospitals across Europe. 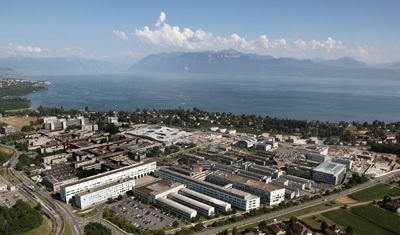 The probes were developed as part of a CTI project (Commission for Technology and Innovation) by three partners: Forimtech (whose founders are from CERN), which contributed its expertise in particle detection, the CHUV, which contributed its clinical expertise, and EPFL, which contributed its expertise in microelectronics and VLSI design.